The television remains the final frontier for the internet. We browse the web on the bus. We browse it on the loo. Thanks to the wonders of satellite broadband we can browse the web at 20,000 feet. We do not, however, browse the web on our TV. This is bizarre, because the TV is the biggest by far of Ray Ozzie's Three Screens but the web barely touches it. Sure you could connect your laptop to your TV, or your iPad. But have you? Have you ever checked email on TV? Surfed Facebook? Watching TV was the leisure activity that occupied the most time (2.8 hours per day), accounting for about half of leisure time, on average, for those age 15 and over. Socializing, such as visiting with friends or attending or hosting social events, was the next most common leisure activity, accounting for nearly three-quarters of an hour per day. Put another way, the TV is the biggest billboard in people's lives, the supposed advertising revolutionaries like Google bare touch it. Instead it runs (give or take a TiVo), pretty much like it did twenty years ago. Turn it on, watch a program. Get force-fed some generic untargeted ads while you do so. Turn it off. Which is a shame, because whoever controls that billboard controls the biggest pot of advertising revenue in the world. This links to what I wrote about yesterday. The TV at the moment functions like an Appliance. It is a box that delivers a single service (pre-prepared, uninteractive video content). Sure manufacturers try to dress up their "Smart TVs" with YouTube, Twitter, Skype, 3D, HD, 3DHD, Wifi, TV Guides and one-click pizza delivery*. 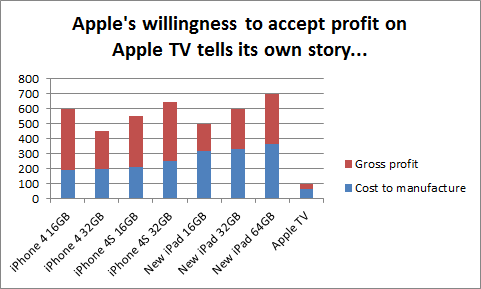 The reality is though, that people just use them as TVs (I ask you again, when did you last check Twitter on your TV). This is going to change, and there are several reasons why. 1) The pipes are in place. Fiber broadband is finally getting to the point where HD video down IP is becoming a reality. You need roughly 5Mb of bandwidth to stream 1080p content. Multiply that a few times for different TVs in different rooms and the odd bit of background PVR and I figure you need a 30-50Mb service to deliver a reliable service. You can just about get that in the UK with Virgin cable and BT Infinity. And that's not mentioning Google's 1 Gigabit tech demo they're putting on in Kansas at the moment. 2) The punters are ready. Consumers are getting used to on-demand TV. Particularly in the UK with a plethora of free-to-air content online via BBC iPlayer, 4-On-Demand, ITV Player (soon to be aggregated into YouView), the idea of consuming TV down an IP line is a reality. I never look at TV schedules anymore - who cares when a TV program is being shown? All that matters is when the playback is going to expire. 3) The vendors are raring to go. Arguably they have for a while - the XBox360 and the PS3 have been obviously stealth plays to become the TV General Compute device for a while (TV was one Microsoft's third screen after all). However Apple and Google are also seriously gearing up. 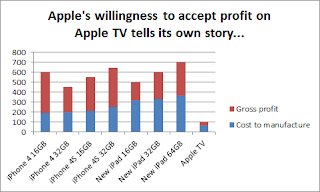 Now you may argue that Apple TV is priced so low because its an irrelevance, it isn't going to sell but it doesn't matter how much they sell it for. This is a mistake - Apple have clearly put the flag in the ground at the $99 price point (the sort of impulse-price point which Logitech have long called the "don't have to ask your spouse point"), and one thing we know about consumer devices is that prices never go up. They willing to take the dogfight down into the weeds to make TV work. Of course there's one thing they still haven't figured out. What to put on the sodding box. For any TV content is king, and this is the one part of the TV puzzle the hardware and software vendors have never managed to crack. Sony tried the hardest with its ill-starred move to into movies and music. Microsoft dipped its toe in the water with MSNBC. But since Sony's failure, the device manufacturers have been very wary about piling into content. And on the other side the broadcasters have been equally paranoid about jumping into bed with device manufacturers. They realise that so long as they control the must-watch content they have the upper hand, and they have seen how the music labels were immolated once they signed these over to the iTunes Music Store. So they are taking things as slowly as they can. So we have the calm before the storm. On all sides the battalions are drawn up, ready to go to war. And what I want to do in the next few posts is run down the order of battle (and think through some of the implications for their share prices). However it plays out though the prize is clear. What is the first name you see when you turn on your TV? In ten years time, that name will be the most important technology company in the world. * Joking about the last one... but that's one helluva idea. Why don't Domino's give away subsidised TV's with an ORDER PIZZA NOW button integrated into the remote. And a beer cooler fitted to the side. As a TV addict, TV to me is the ultimate one button device. All you need to do is switch it on. It is available for free, always giving and never ask for anything in return. Sometimes we are just too lazy to decide for ourselves what to watch. Did you know you can create short urls with Shortest and get cash for every click on your shortened links.